BT Group plc is a holding company which owns British Telecommunications plc, trading as BT, a British multinational telecommunications services company with head offices in London, United Kingdom. It has operations in around 170 countries. BT controls a number of large subsidiaries. BT Global Services division supplies telecoms services to corporate and government customers worldwide, and its BT Consumer division supplies telephony, broadband, and subscription television services in Great Britain to around 18 million customers. In February 2015, BT announced an agreement to purchase the British mobile phone network EE Limited for £12.5bn, subject to regulatory approval. Most of BT's profits are generated by its Openreach subsidiary, which controls the UK's 'last mile' copper infrastructure. Since 2005, BT have been accused of abusing their control of Openreach, particularly by underinvesting in the UK's broadband infrastructure, charging high prices and providing poor customer service. The UK's telecoms regulator Ofcom is currently investigating whether to order BT to sell Openreach, and is expected to report in January 2016. BT's origins date back to the establishment of the first telecommunications companies in Britain. Among them was the first commercial telegraph service, the Electric Telegraph Company, established in 1846. As these companies amalgamated and were taken over or collapsed, the remaining companies were transferred to state control under the Post Office in 1912. These companies were merged and rebranded as British Telecom. In January 1878 Alexander Graham Bell demonstrated his recently developed telephone to Queen Victoria at Osborne House on the Isle of Wight. A few days later the first telephone in Britain was installed, under licence from the General Post Office, by engineers from David Moseley and Sons, to connect the Dantzic Street premises of Manchester hardware merchant, Mr. John Hudson, with his other premises in nearby Shudehill. As the number of installed telephones across the country grew it became sensible to consider constructing telephone exchanges to allow all the telephones in each city to be connected together. The first exchange was opened in London in August 1879, closely followed by the Lancashire Telephonic Exchange in Manchester. From 1878, the telephone service in Britain was provided by private sector companies such as the National Telephone Company, and later by the General Post Office. In 1896, the National Telephone Company was taken over by the General Post Office. In 1912 it became the primary supplier of telecommunications services, after the Post Office took over the private sector telephone service in GB, except for a few local authority services. Those services all folded within a few years, the sole exception being Kingston upon Hull, where the telephone department became present day KCOM Group. Telegraph and Telephone services became the exclusive responsibility of the Post Office Engineering department. Converting the Post Office into a nationalised industry, as opposed to a governmental department, was first discussed in 1932 by Lord Wolmer. In 1932 the Bridgeman Committee produced a report that was rejected. In 1961, more proposals were ignored. The Post Office remained a department of central government, with the Postmaster General sitting in Cabinet as a Secretary of State. In March 1965, Post, Telecommunications, Savings, Giro and National Data Processing Services, it was decided that there should be two: Post and Telecommunications. These events finally resulted in the introduction of the Post Office Act, 1969. On 1 October 1969, under the Post Office Act of 1969, the Post Office ceased to be a government department and it became established as a public corporation. The Act gave the Post Office the exclusive privilege of operating telecommunications systems with listed powers to authorise others to run such systems. Effectively, the General Post Office retained its telecommunications monopoly. In 1977, the Carter Committee Report recommended a further division of the two main services and for their relocation under two individual corporations. The findings contained in the report led to the renaming of Post Office Telecommunications as British Telecommunications (trading as British Telecom) in 1980, although it remained part of the Post Office. The British Telecommunications Act 1981 transferred the responsibility for telecommunications services from the Post Office, creating two separate corporations, Post Office Ltd. and British Telecommunications. At this time the first steps were taken to introduce competition into British telecommunications industry. In particular, the Act empowered the Secretary of State for Trade and Industry, as well as British Telecommunications, to license other operators to run public telecommunications systems. Additionally, a framework was established which enabled the Secretary of State to set standards with the British Standards Institution (BSI) for apparatus supplied to the public by third parties, and had the effect of requiring British Telecommunications to connect approved apparatus to its systems. The Secretary of State made use of these new powers and began the process of opening up the apparatus supply market, where a phased programme of liberalisation was started in 1981. In 1982, a licence was granted to Cable & Wireless to run a public telecommunications network through its subsidiary, Mercury Communications Ltd.
On 19 July 1982, the Government formally announced its intention to privatise British Telecommunications with the sale of up to 51% of the company's shares to private investors. This intention was confirmed by the passing of the Telecommunications Act 1984, which received Royal Assent on 12 April that year. The transfer to British Telecommunications plc of the business of British Telecommunications, the statutory corporation, took place on 6 August 1984 and, on 20 November 1984, more than 50 per cent of British Telecommunications shares were sold to the public. At the time, this was the largest share issue in the world. The new legislation was intended to enable British Telecommunications to become more responsive to competition in GB and to expand its operations globally. Commercial freedom granted to British Telecommunications allowed it to enter into new joint ventures and, if it so decided, to engage in the manufacture of its own apparatus. The company's transfer into the private sector continued in December 1991 when the Government sold around half its remaining holding of 47.6% of shares, reducing its stake to 21.8%. Substantially all the government's remaining shares were sold in a third flotation in July 1993, raising £5 billion for the Treasury and introducing 750,000 new shareholders to the company. The 1984 Act also abolished British Telecommunications's exclusive privilege of running telecommunications systems and established a framework to safeguard the workings of competition. This meant that British Telecommunications finally lost its monopoly in running telecommunications systems, which it had technically retained under the 1981 Act despite the Secretary of State's licensing powers. It now required a licence in the same way as any other telecommunications operator. The principal licence granted to British Telecommunications laid down strict and extensive conditions affecting the range of its activities, including those of manufacture and supply of apparatus. In 1985, Cellnet was launched as a subsidiary of Telecom Securicor Cellular Radio Limited, a 60:40 venture between British Telecommunications and Securicor respectively. Securicor originally invested £4 million in Cellnet in 1983. In 1999, BT purchased Securicor's shares in Cellnet for £3.15 billion. The company was later rebranded as BT Cellnet, and became a part of BT Wireless, a group of subsidiary companies owned by BT. The next major development for British Telecommunications, and a move towards a more open market in telecommunications, occurred in 1991. On 5 March, the Government's White Paper, "Competition and Choice: Telecommunications Policy" for the 1990s, was issued. In effect, it ended the duopoly which had been shared by British Telecommunications and Mercury Communications in the UK since November 1983 and the build-up to privatisation. The new policy enabled customers to acquire telecommunications services from competing providers using a variety of technologies. Independent "retail" companies were permitted to bulk-buy telecommunications capacity and sell it in packages to business and domestic users. The White Paper was endorsed by British Telecommunications, the new policy enabling the company to compete freely and more effectively by offering flexible pricing packages to meet the needs of different types of customer. The BT brand and piper logo were introduced in 1991. The logo remained until 2003. On 2 April 1991, the company started using a new trading name, BT, and branding. In June 1994, BT and MCI Communication Corporation, the second largest carrier of long distance telecommunications services in the United States, launched Concert Communications Services, a $1 billion joint venture company. This alliance gave BT and MCI a global network for providing end-to-end connectivity for advanced business services. Concert was the first company to provide a single-source broad portfolio of global communications services for multinational customers. On 3 November 1996, BT and MCI announced they had entered into a merger agreement to create a global telecommunications company called Concert plc, to be incorporated in GB, with headquarters in both London and Washington, D.C. As part of the alliance BT acquired a 20% holding in MCI. Nevertheless, following U.S. carrier WorldCom's rival bid for MCI on 1 October 1997, BT ultimately decided in November, to sell its stake in MCI to WorldCom for $7 billion. The deal with WorldCom resulted in a profit of more than $2 billion on BT's original investment in MCI, with an additional $465 million severance fee for the break-up of the proposed merger. In December 2000, following modifications to BT’s licence in April 2000, BT offered local loop unbundling (LLU) to other telecommunications operators, enabling them to use BT’s copper local loops (the connection between the customer’s premises and the exchange) to connect directly with their customers. Following the dot com crash, the group undertook a board restructuring and asset sale to address its large debts. In May 2001, BT announced a three-for-ten rights issue to raise £5.9 billion—still GB's largest ever rights issue—and the sale of Yell Group, the international directories and associated e-commerce business, for £2.14 billion. Both activities were completed in June 2001. The group also sold its property portfolio to Telereal, a property company. BT renamed its BT Wireless division as O2 in September 2001, and confirmed it planned to demerge the unit in November that year. Shareholders approved the demerger at a extraordinary general meeting held in Birmingham in October 2001, with 4.297 billion British Telecommunications shares voted in favour, and 0.67 million voted against. BT Wireless demerged In 2001, and was relaunched on 18 June 2002 as O2. O2 was ultimately acquired by Telefónica in 2007. In April 2003, BT unveiled its current corporate identity, known as the "Connected World", and brand values. Reflecting the aspirations of a technologically innovative future, the connected world is designed to embody BT’s five corporate values: trustworthy, helpful, inspiring, straightforward, heart. The globe device part of the logo was originally designed by the Wolff Olins brand consultancy for BT's Concert joint venture with AT&T, and was subsequently used by BT's internet division, Openworld, prior to being adopted by the company as a whole. The Communications Act, 2003, which came into force on 25 July 2003, introduced a new industry regulator, the Office of Communications (Ofcom), to replace the Office of Telecommunications (Oftel). It also introduced a new regulatory framework. The licensing regime was replaced by a general authorisation for companies to provide telecommunications services subject to general conditions of entitlement and, in some instances, specific conditions. Under a specific condition BT retained its universal service obligation (USO) for GB, excluding the Hull area. The USO included connecting consumers to the fixed telephone network, schemes for consumers with special social needs, and the provision of call box services. In the summer of 2004, BT launched Consult 21, an industry consultation for BT’s 21st century network (21CN) programme. 21CN is a next-generation network transformation, that, at one time, was due for completion by the end of 2010. Using internet protocol technology, 21CN will replace the existing networks and communications from any device such as mobile phone, PC, PDA, or home phone, to any other device. In 2004, BT was awarded the contract to deliver and manage N3, a secure and fast broadband network for the NHS National Programme for IT (NPfIT) program, on behalf of the English National Health Service (NHS). In 2005 BT made a number of important acquisitions. In February 2005, BT acquired Infonet (now re-branded BT Infonet), a large telecoms company based in El Segundo, California, giving BT access to new geographies. It also acquired the second largest telecoms operator in the Italian business market, Albacom. Then in April 2005, it bought Radianz from Reuters (now rebranded as BT Radianz), which expanded BT's coverage and provided BT with more buying power in certain countries. In August 2006 BT acquired online electrical retailer Dabs.com for £30.6 million. The BT Home Hub manufactured by Inventel was also launched in June 2006. In October 2006 BT confirmed that it would be investing 75% of its total capital spending, put at £10 billion over five years, in its new Internet Protocol (IP) based 21st century network (21CN). Annual savings of £1 billion per annum were expected when the transition to the new network was to have been completed in 2010, with over 50% of its customers to have been transferred by 2008. (For actual progress see BT 21CN). That month the first customers on to 21CN was successfully tested at Adastral Park in Suffolk. In January 2007, BT acquired Sheffield-based ISP, PlusNet plc, adding 200,000 customers. BT stated that PlusNet will continue to operate separately out of its Sheffield head-office. 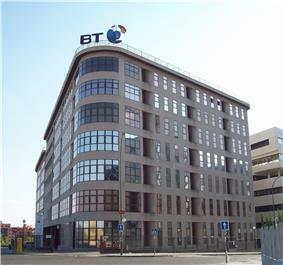 On 1 February 2007, BT announced agreed terms to acquire International Network Services Inc. (INS), an international provider of IT consultancy and software. This increases BT presence in North America enhancing BT's consulting capabilities. On 20 February 2007, Sir Michael Rake, then chairman of accountancy firm KPMG International, succeeded Sir Christopher Bland, who stepped down in September of that year. On 20 April 2007, BT acquired Comsat International which provides network services to the South American corporate market. On 1 October 2007, BT purchased Chesterfield based Lynx Technology which has been trading since 1973. BT acquired Wire One Communications in June 2008 and folded the company into "BT Conferencing", its existing conferencing unit, as a new video business unit In July 2008, BT acquired the online business directory firm Ufindus for £20 million in order to expand its position in the local information market in GB. On 28 July 2008, BT acquired Ribbit, of Mountain View, California, "Silicon Valley's First Phone Company". Ribbit provides Adobe Flash/Flex APIs, allowing web developers to incorporate telephony features into their software as a service (SaaS) applications. In the early days of its fibre broadband rollout, BT said it would deliver fibre-to-the-premises (FTTP) to around 25% of the Country, with the rest catered for by the slower fibre-to-the-cabinet (FTTC), which uses copper wiring to deliver the final stretch of the connection. In 2014, with less than 0.7% of the company's fibre network being FTTP, BT dropped the 25% target, saying that it was "far less relevant today" because of improvements made to the headline speed of FTTC, which had doubled to 80Mbits/sec since its fibre broadband rollout was first announced. To supplement FTTC, BT offered an 'FTTP on Demand' product. In January 2015, BT stopped taking orders for the on-demand product. On 1 April 2009, BT Engage IT was created from the merger of two previous BT acquisitions, Lynx Technology and Basilica. Apart from the name change not much else changed in operations for another 12 months. 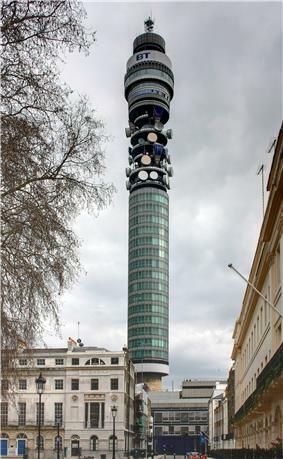 On 14 May 2009, BT said it was cutting up to 15,000 jobs in the coming year after it announced its results for the year to 31 March 2009. Then in July 2009 BT offered workers a long holiday for an up front sum of 25% of their annual wage or a one-off payment of £1000 if they agree to go part-time. In March 2013 BT was allocated 4G spectrum in the UK following an auction and assignment by Ofcom, after paying £201.5m. On 1 August 2013, BT launched its first television channels, BT Sport, to compete with rival broadcaster Sky Sports. Plans for the channels' launch came about when it was announced in June 2012 that BT had been awarded a package of broadcast rights for the Premier League from the 2013–14 to 2015–16 season, broadcasting 38 matches from each season. In February 2013, BT acquired ESPN Inc.'s UK and Ireland TV channels, continuing its expansion into sports broadcasting. ESPN America and ESPN Classic were both closed, while ESPN continued to be operated by BT. On 9 November BT announced it had acquired exclusive rights to the Champions League and Europa League for £897m, from the 2015 season, with some free games remaining including both finals. On 24 November 2014, shares in BT rose considerably on the announcement that the company were in talks to buy back O2; while at the same time BT confirmed that it had been approached by EE to also buy that company. BT confirmed on 15 December 2014 that it had entered into exclusive talks to buy EE. BT confirmed on 5 February 2015 that it had agreed to buy EE for £12.5 billion, subject to regulatory approval. The deal will combine BT's 10 million retail customers and EE's 24.5 million direct mobile subscribers. Deutsche Telekom will own 12% of BT, while Orange will own 4%. In March 2015 launched a 4G service as BT Mobile  BT Group CEO Gavin Patterson announced that BT plans to migrate all of its customers onto the IP network by 2025, switching off the company's ISDN network. The UK's telecoms regulator Ofcom is currently investigating whether to order BT to sell Openreach, following complaints BT were behaving abusively, underinvesting in the UK's broadband infrastructure, charging high prices and providing poor customer service. BT Group is a holding company; the majority of its businesses and assets are held by its wholly owned subsidiary British Telecommunications plc. BT's businesses are operated under special government regulation by the British telecoms regulator Ofcom (formerly Oftel). BT has been found to have significant market power in some markets following market reviews by Ofcom. In these markets, BT is required to comply with additional obligations such as meeting reasonable requests to supply services and not to discriminate. BT runs the telephone exchanges, trunk network and local loop connections for the vast majority of British fixed-line telephones. Currently BT is responsible for approximately 28 million telephone lines in GB. Apart from KCOM Group, which serves Kingston upon Hull, BT is the only UK telecoms operator to have a Universal Service Obligation, (USO) which means it must provide a fixed telephone line to any address in the UK. It is also obliged to provide public call boxes. 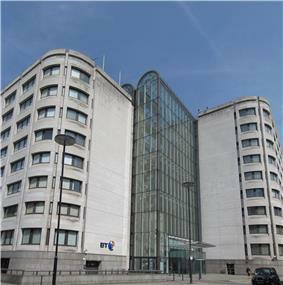 BT Group's world headquarters and registered office is the BT Centre, a 10-storey office building at 81 Newgate Street in the City of London, opposite St. Paul's tube station. BT Technology, Service & Operations – responsible for the innovation, design, test, build and running of BT’s global networks and systems. Openreach was established following the Telecommunications Strategic Review carried out by Ofcom. BT signed legally binding undertakings with Ofcom in September 2005 to help create a new regulatory framework for BT and the British telecoms industry generally. Openreach commenced operations on 11 January 2006, with 25,000 engineers previously employed by BT's Retail and Wholesale divisions. It provides provision and repair in the "last mile" of copper wire and is designed to ensure that other communications providers (CPs) have exactly the same operational conditions as parts of the BT Group. BT has the largest defined benefit pension plan of any UK public company. The trustees valued the scheme at £36.7 billion at the end of 2010; An actuarial valuation valued the deficit of the scheme at £9.043 billion as of 31 December 2008. However following a change in the regulations governing inflation index linking, the deficit was estimated at £5.2 billion in November 2010. BT and the Trustee have agreed a 17-year recovery plan with the first three years’ payments amounting to £525M. As of 2013 average annual payments have been estimated at £533M. The next triennial valuation is scheduled for 2014. BT’s pension obligation is derived from two pension plans: BTPS, the company’s defined-benefit pension scheme which was closed in 2001, and the BT Retirement Saving Scheme (BTRSS), which was set up to replace the BTPS and is a defined-contribution retirement plan. In 2004 the BT Group signed the world's largest renewable energy deal with npower and British Gas, and now all of their exchanges, satellite networks and offices are powered by renewable energy. BT is a member of the Corporate Leaders Group on Climate Change. They signed a letter urging the government to do more to tackle this problem. Janet Blake, head of global corporate social responsibility at BT, says that she would like to see incentives that find ways of rewarding those companies that focus on climate change by making investments in green business models. BT has made it clear that it has an ambitious plan to reduce carbon dioxide emissions. Its strategy includes steps to reduce the company's carbon footprint as well as those of customers, suppliers and employees. BT has actually pledged to achieve an 80% reduction by the year 2016, which will require further efficiency improvements. BT have been accused of abusing their control of Openreach, underinvesting in the UK's broadband infrastructure, charging high prices and providing poor customer service. Openreach's services receive hundreds of thousands of complaints on an annual basis. In 2009, BT announced it would connect 2.5 million British homes to ultra-fast FTTP by 2012 and 25% of the UK. However, by the end of September 2015 only 250,000 homes were connected. BT has also stopped taking orders for its FTTP-on-demand product. Between 2010 and 2012 the UK intelligence community initiated an investigation aimed at Huawei, the foreign supplier of BT's new fibre infrastructure with increasing urgency after the USA, Canada and Australia prevented the company from operating in their countries. Although BT had notified the UK government in 2003 of Huawei's interest in their £10b network upgrade contract, they did not raise the security implications as BT failed to explain that the Chinese company would have unfettered access to critical infrastructure. On 16 December 2012 David Cameron was supplied with a in-depth report indicating that the intelligence services had very grave doubts regarding Huawei, in that the UK governmental, military, business community and private citizen's privacy may be under serious threat. Subsequently, BT's Infinity program and other projects are now under urgent review. On 7 June 2013, British lawmakers concluded that BT should never have allowed the Chinese company access to the UK's critical communications network without ministerial oversight, saying they were 'deeply shocked' that BT did not inform government that they were allowing Huawei and ZTE, both foreign entities with ties to the Chinese military unfettered access to critical national systems. Furthermore, ministers discovered that the agency with responsibility to ensure Chinese equipment and code, was threat-free was entirely staffed by Huawei employees. Subsequently, parliamentarians confirmed that in case of an attack on the UK there was nothing at this point that could done to stop Chinese infiltration attacking critical national infrastructure. Another Chinese company ZTE supplying extensive network equipment and subscriber hardware to BT Infinity is also under scrutiny after the US, Canada, Australia and the European Union declared the company a security risk to its citizens. In 2001, BT discovered it owned a patent (U.S. Patent 4,873,662) which it believed gave it patent rights on the use of hyperlink technology on the World Wide Web. The corresponding UK patent had already expired, but the U.S. patent was valid until 2006. On 11 February 2002, BT began a court case relating to its claims in a U.S. federal court against the Internet service provider Prodigy Communications Corporation. In the case British Telecommunications Plc. v. Prodigy, the United States District Court for the Southern District of New York ruled on 22 August 2002 that the BT patent was not applicable to web technology and granted Prodigy's request for summary judgment of non-infringement. In September 2012, BT entered into a $23 million deal with the US military to provide a key communications cable connecting RAF Croughton, a US military base on UK soil, with Camp Lemonnier, a large US base in Djibouti. Camp Lemonnier is used as a base for American drone attacks in Yemen and Somalia, and has been described by The Economist as "the most important base for drone operations outside the war zone of Afghanistan." Human rights groups including Reprieve and Amnesty International have criticised the use of armed drones outside declared war zones. Evidence produced by The Bureau of Investigative Journalism and Stanford University's International Human Rights & Conflict Resolution Clinic suggest that drone strikes have caused substantial civilian casualties, and may be illegal under international law. In 2013, BT was the subject of a complaint by Reprieve to the Department of Business, Innovation and Skills under the OECD Guidelines for Multinational Enterprises, following their refusal to explain whether or not their infrastructure was used to facilitate drone strikes. The subsequent refusal of this complaint was appealed in May 2014, on the basis that the UK National Contact Point’s decision did not follow the OECD Guidelines. The issue of bias was also raised, due to the appointment of Lord Ian Livingston as government minister for the department which was processing the complaint: Livingston had occupied a senior position at BT when the cable between RAF Croughton and Camp Lemonnier was originally built. ^ BBC Sport - Champions League: BT Sport wins £897m football rights deal. Bbc.co.uk (2013-11-09). Retrieved on 2013-12-09. Tucker, D. G. "The Early Development of the British Underground Trunk Telephone Network," Transactions of the Newcomen Society (1978) 49: 57-74. Wetton, Jenny. "The Early History of Telephony in Manchester, 1877–1898," Transactions of the Newcomen Society (2007) 77#2 pp 245–260.